With the inventory buffer largely depleted, the market is again sensitive to geopolitical supply disruptions. Supply losses are likely in 2018 given the fragile state of the Middle East, such as the ongoing disruption to Iraqi Kirkuk output. The escalating stand-off between Saudi Arabia and Iran is a key dynamic to watch, fuelled by rapid reforms in the Kingdom and rising anti-Iran sentiment. While it was the upward surprise to OECD demand that heralded a third straight year of strong demand growth in 2017, we expect the non-OECD to fully take hold of the demand growth baton in 2018. 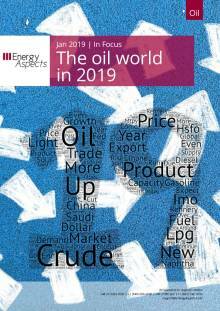 We expect another healthy year of oil demand growth, at around 1.7 mb/d y/y, with upticks in the demand outlook for India, Latin America and the Middle East. We forecast 1.7 mb/d of non-OPEC supply growth this year, most of which originates from the Americas. Between 2013 and 2018, an average of 31 projects (peak capacity 1.8 mb/d) have come online each year. But for 2019 and 2020, there are only an average of 15 projects (peak capacity of 1 mb/d), and this will increasingly become the focus of the market by year-end 2018. Despite promises of a new ‘returns focussed’ approach to developing shale assets, a combination of ample availability of capital and tailwinds from a near 40% rally in oil prices since H2 17 is set to spur 1.4 mb/d of liquids production growth from the US this year, of which 0.95 mb/d is crude. The Permian will continue ripping higher (+0.67 mb/d), followed by the Williston and the DJ basins. We expect US crude exports will rise by 0.4 mb/d y/y this year, driven by higher departures from the Gulf Coast (+0.45 mb/d y/y) as PADD 3 production surges by 0.78 mb/d y/y. While higher PADD 3 runs will partially offset supply growth, we expect increasing volumes of WTI, Bakken and Rockies oil to leave Gulf Coast ports this year destined for refineries in Asia, Europe and Canada. The light crude complex has staged an impressive rally since H2 17, supported by products spec changes, a buoyant naphtha market and a change in China’s crude slate preference as it focusses more on petchems. 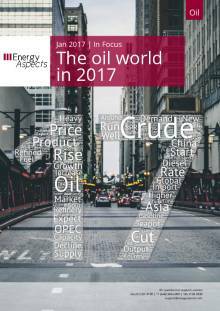 These trends will largely continue through 2018, at least H1 18, even though OPEC production cuts and sharply lower LatAm output will continue to support heavy grades. In 2018, Chinese imports are set to rise again, by 0.4-0.5 mb/d y/y, led by independent refiners. But with product export quotas capped, at least for the teapots, the Year of the Dog will be marked by stiff competition for domestic market share. Asian products markets should be spared the Chinese product deluge, at least in H1 18, but the petchem dynamics will become key to watch. Global net CDU additions will be 0.8 mb/d at most in 2018, far undershooting demand growth of 1.7 mb/d. With OECD stocks on a fast track to the five-year average, product markets are gearing up for another year of tightness—particularly in the first half. As the bulk of capacity additions will be made in the East of Suez, margins here may underperform those further west. Helped by recovering non-OECD economies, global diesel demand will again confound the naysayers this year, rising by an estimated 0.6-0.7 mb/d. Accelerating economic growth will also be a boon for naphtha and gasoline demand, though rising LPG supplies could weaken the light ends complex in H2 18, while higher oil prices may weigh on gasoline growth later in the year. Reports of an impending electrification of the vehicle pool are overdone, yet they have dampened expectations for oil demand. Sales of electric vehicles (EVs) have grown rapidly, but they still pale in comparison with the total size of the world’s passenger light-duty vehicle fleet. 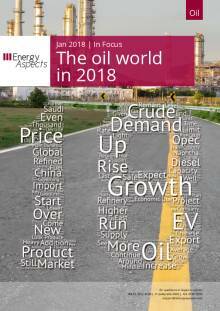 Not until the late 2020s will EVs significantly dampen prospective oil demand, but they will remain topical in 2018.